Heading into the 2018-19 season, the Kennedy boys basketball team looked to be among the handful of favorites to make a run at a 2A state championship. Led by Second Team All-State forward Emorej Lynk, the Trojans returned nearly every principal player from the previous year's team that finished fourth in state. But the season was dealt a sharp blow before Kennedy was even able to take the court, after Lynk went down with a season-ending knee injury in the first half of the football team's state championship game on November. The Trojans went on to win the game — the first state title in program history — but Lynk's injury left the basketball team with a tremendous hurdle to clear heading into the winter season. Yet, as the team nears the end of the regular season, the Trojans look once again poised to make the state playoffs and challenge for a trip to the quarterfinals for the third time in the past four years. Head coach Karl Schmidtman credits the team's determination to rise to the challenge as the reason the team has continued to rank among the state's elite teams. "Emorej is a great player, and any team that loses a player like that is going to have to make some adjustments," Schmidtman said. "What I've been really happy with is that the guys have stepped into some roles they didn't expect to be in. Filling some of those shoes that Emorej left behind." With three straight victories last week, the No. 8 Trojans sit at 15-6 overall and 9-3 in the Tri-River Conference — one game behind the No. 7 Sheridan Spartans (17-3, 10-2) for second place in the league standings. Much of that has been due to the team's veteran roster, which has been able to shoulder the burden of losing a player of Lynk's caliber. Led by 6-foot-6 post Rocco Carley, the Trojans feature six seniors on this year's team, all of which play significant roles for the team night in and night out. Carley has taken over the role as the team's offensive focal point, both due to his rare height at the 2A level, but also because of his basketball IQ and leadership helps keep Kennedy steady from game to game. "He's got great insight on the game; he understands basketball very well," Schmidtman said. "He's always got great comments in the locker room and is a great leader for the guys." Case in point: the Trojans' 52-47 win over No. 10 Santiam this week. 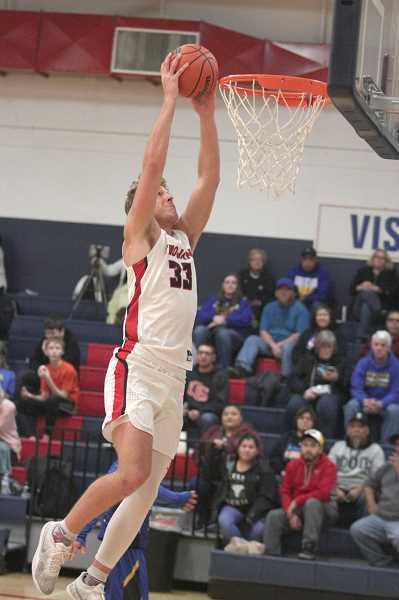 Facing a three-point deficit heading into the final quarter against the Wolverines, Carley put the team on his back and scored 21 points to give Kennedy a much-needed win and keep them locked in behind Sheridan in the league race. "We do look to him," Schmidtman said. "If we're having a hard time, our team wants to get the ball to Rocco and we look to him to lead us out of those situations." But it's not all the Rocco Show. Kennedy has shown versatility in the way in which it spread the offense around this season and has relied heavily on its team defense as a means of kick-starting the offense. Kennedy's 85-27 home victory over the Gervais Cougars on Friday marked the third consecutive game in which the Trojans held their opponents under 50 points. "I think when we are doing our best, the defense fuels what we do," Schmidtman said. "We created a ton of offense with our defense. We were up in passing lanes and pressing the ball, and I was pretty happy with that." Kennedy was scheduled to travel to Culver on Monday before returning home Wednesday to face the Delphian Dragons. The Trojans will finish the week at Chemawa on Friday.